When most people think of New York that automatically think of the lights, sights, and sounds of New York City but New York has so much more to offer than The Big Apple, especially to RVers. The Empire State has some of the most beautiful mountain ranges, lakes, and countryside you’ll encounter in the United States. If you love four seasons of weather and meeting new people, this is the place to go on an adventure. Let’s look at the top five RV parks and campgrounds in New York, why you should visit, and what you can do when you arrive. Turning Stone Resort and Casino makes sure its RV park is well stocked for guests. The Villages RV Park greets you with 175 RV sites that include full utility hookups along with complimentary Wi-Fi access. The park also contains two clean bathhouses and a laundromat. Restock on supplies at the camp store, get your propane refilled or take the complimentary shuttle to the Casino itself or one of the nearby golf courses. The main draw of the Villages is, of course, Turning Stone Casino and Resort. For fun, take the complimentary shuttle for a wide array of table games and slots, or catch some of the live music and entertainment while enjoying some delicious fun. To relax, visit Turning Stone’s fabulous spa or try to lower your handicap at one of the five golf courses. New York is home to the spectacular site of Niagara Falls, and Branches of Niagara Campground and Resort gives you a prime location for this scene. Branches houses 60 RV sites with your choice of 20/30/50-amp electric hookups, water, and sewer. Each site is also joined with a secluded grass patio, picnic table, and fire ring. All RV sites are located very close to bathhouse and laundry facilities. Branches also has a general store, an activity building, and 24-hour security patrol. Your primary reason for choosing Branches other than the amenities and facilities is its proximity to beautiful Niagara Falls, only ten minutes from Branches. Buffalo, New York is also only 15 minutes down the road and contains family-friendly attractions like the Buffalo Zoo and the Buffalo Museum of Science. Anglers can travel to the Lower or Upper Niagara for some excellent fishing. Black Bear Campground is located with natural beauty all around but is less than an hour away from New York City. There are plenty of amenities to go around; Black Bear Campground can accommodate big rigs with its spacious pull through or back in lots, all outfitted with full utility hookups, free cable TV, and Wi-Fi access. There are clean restrooms, complimentary showers, and two laundromats to clean up and out. Black Bear is also equipped with a camp store, picnic tables, fire rings, and group pavilions. There are plenty of onsite activities like arcades, a swimming pool, and mini golf but there is more fun in the nearby area. Black Bear offers guided tours into the Heart of New York City so that you can see all the classic spots. 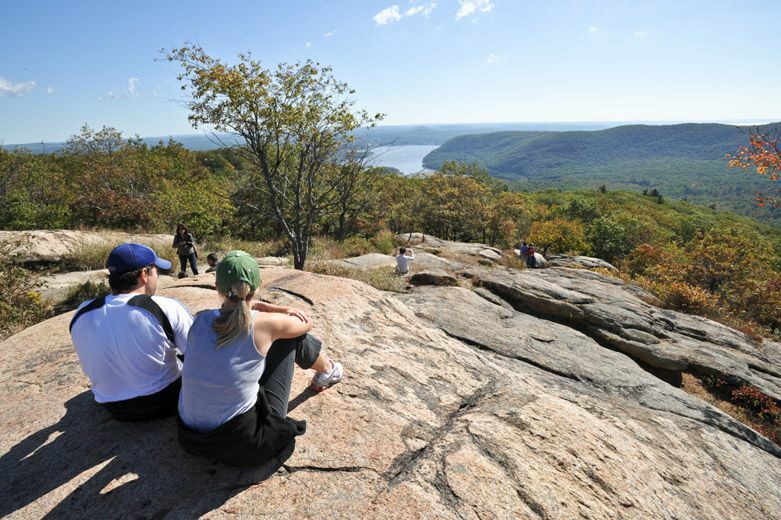 Black Bear is also near many beautiful outdoor recreation areas including the sprawling Harriman State Park and the hikes and scenery of the Appalachian Trail. Watkin Glens State Park is one of the most beautiful and famous state parks in all New York State, and the Watkins Glen/Corning KOA has the amenities to enjoy it. The Watkins Glen/Corning KOA has more than 100 different RV sites to choose from, everything from economy sites with full utility hookups to premium patio sites outfitted for big rigs with large concrete patios, you can even score a simple water and electric site for your pop-up camper. The park also contains large bathhouses, laundry facilities, group pavilions, camp store, fitness center and more. There are a ton of family-friendly activities at this KOA, fishing, a pirate-themed playground, nature trails, mini golf and plenty more, you’ll be hard-pressed to get bored at this campground. Fortunately, if you do get bored, this campsite is surrounded by natural beauty. Watkins Glen is in the heart of the Finger Lake Region housing several waterfalls, State Parks and the prize of them all, Watkins Glen Gorge. This KOA is also an excellent destination for catching some NASCAR at Watkins Glen International. Lake George RV Park is continually ranked as one of the top rated parks in the country by New York City and a few nights there will help you know why. Lake George has 400 different pull through and back in sites, all outfitted with 30/50-amp hookups, water, sewer, cable TV, Wi-Fi, fire ring and picnic table. The restrooms, showers and laundry facilities are sparkling clean an open 24 hours a day. There is a fitness center, large camp store, indoor and outdoor recreation facilities, bonfire pavilion and even a camper cafe. You can stay in the park for fun with pools, live events in their playhouse, planned activities, fishing in their private stocked pond, biking trails, arcades and a slew of camping pastimes like horseshoes, volleyball, basketball, and much more. You also have all the beautiful biking, boating, fishing, hiking and other fun found in both Lake George itself and the Adirondack Mountains. Other nearby attractions include the Adventure Family Fun Center, Great Escape, Splashwater Kingdom, Natural Stone Bridge, and Caves Park to name a few. New York is more than The Big Apple. It’s mountains and rivers and lakes. It’s amusement parks and beaches. It’s boroughs like Brooklyn and cities like Rochester and everything in between. If you’re looking for a slice from both sides of an apple, visit New York in an RV.